Our House With “For Sale” Sign. We’re Moving. Link (Click on “Link” to see an evolving web page re: the move). I’ve just cleaned the kitchen floor after Moe peed on it again. Maybe he missed the low sided training tray we got because old pudge was having trouble climbing over anything higher and was taking to peeing on the outside of the kitty litter boxes. 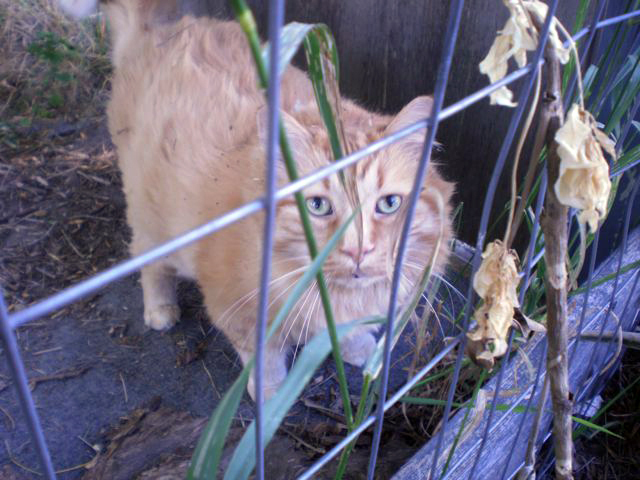 Moe, behind bars in the “cat-run”. The cats are peeing and poo-ing beyond their usual places to let us know they’re not happy with the changes in their environment. Their environment is changing here inside the house because we’re getting ready to move. We can’t move to a new province with mon amour foo’s new job until we sell this house. The cats obviously don’t want us to sell this house. They figure if they stink the place up enough, nobody will want to buy it and they’ll be safely stagnant in their beloved familiar environment. They don’t believe me when I tell them they’ll like whatever new place we go even better. Domino’s the best listener, he looks at me and almost rolls his eyes. We began knowing we were going to move a while ago. It took the love of my life’s employer almost six months to get the actual gears in motion to bring her on board and relocated to another time zone east of here. I’ve been resetting the Vonage VOIP telephone router at least once a day, often twice. I think I cleaned up after the cat who can’t quite aim his pee stream at the kitty litter tray mentioned above… um, at least twice a day. And this evening we demolished our poor worry wart cat’s most secure refuge in the name of selling this place. I built an industrial strength bird sanctuary/aviary/bird cage to protect the kids’ budgies (aka Parakeets) from our sixteen pound Bengal cat. Domino is the Bengal. He took up residence on top of the six foot high, four feet wide, three feet deep aviary (with a plywood roof and back and Domino-proof acrylic panels covering the top eighteen inches of heavy duty ‘wire cloth’ fencing material that was stapled to two by three uprights and the staples were covered with what look like bed slats) (but made of softer wood) (We will find at least one of our photos of the aviary and edit it in here.) But anyway. The aviary is in pieces outside, ready to be loaded into the van for a trip to the land-fill. Of course, we may have to carefully inspect every inch of this house for signs of his disapproval of the way things are going these days. But I am so close to ‘brain fried’ at the moment that I better end here and pack it in for a couple hours. We have to take the boof out and lock the cats up again today, more viewers are coming to take a look. ——So we stayed up pretty much all last night and dragged ourselves out of bed around 11:00 this morning and pretty much jumped right into getting junk to the landfill and steadily cleaning all the carpets, mopping up Moe’s pee almost before he thought about missing the kitty litter tray again. We febreezed a lot and left the windows open with the air conditioner on. No, we didn’t cool the town off any. We got out of here with like thirty seconds to spare before today’s viewers were here. And they were already here. All the cats were in lock down or hiding securely and we brought the dog to the beach where nearly an hour of splashing and digging in six inches to a foot of water wasn’t enough, we had to pretty much drag him all the way to the vehicle, him trying to drag us back to the water the whole time. ——But when we got here and I went to let the cats out of the jails, the upstairs guy’s room smelled like he’d pooped and peed the whole time we were gone. I mean it smelled worse to me than ever. The girl’s room, south east of the smelly cat room, smelled almost as bad. Now this is with the windows open the whole day, and all last night. How the bleep would keeping the windows open make the place smell worse than closing the windows and baking the smells in? Cathi flipped the mattress in the girl’s room and gagged, yeah, before we began locking the room up so cats could not get in, the guest cat thoroughly ruined the mattress. So it looks like we will be dragging another mattress out to the garage until our next trip to the land fill, and maybe dragging a dresser along with it. ———Sunday, July 28, 2013. 24°C / 75°F @ 3 pm. ———We got a call mid morning to tell us that today’s viewers were not feeling well and cancelled or postponed their viewing. We sighed with relief and went back into dreamland. I dreamed I heading back to boot camp and was telling the younger (Much Younger) first time recruits or draftees that I’d been through this before and I knew where we were going. 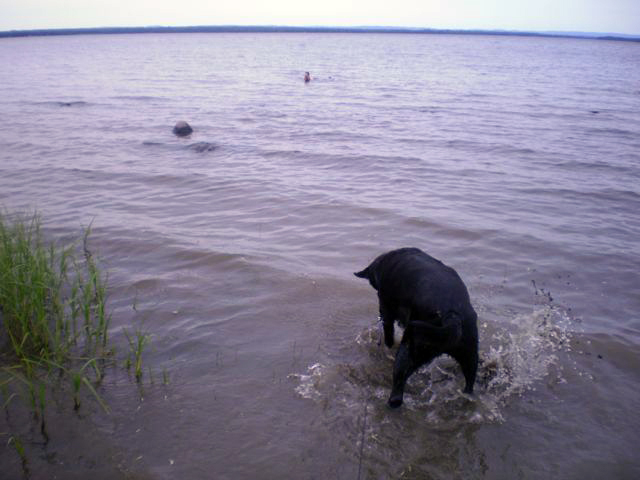 ———Later took the dog to the beach for more digging in shallow water. He seems to be making progress there. His spot is probably 6 to 8 inches deeper than the surrounding area. I was watching a cloud of silt spread out from where he was very busy with the serious task of digging his trench. 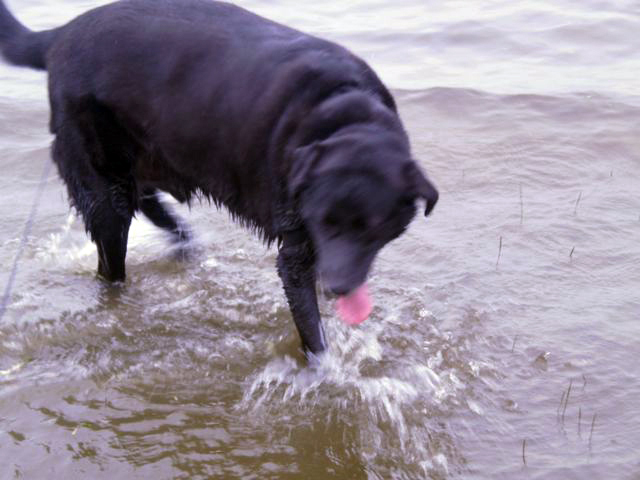 Again, he didn’t want to leave the water, did not want to go home. After he gave up trying to drag me back to the water he plunked down and refused to move. I snapped the short leash (while he was hooked to the long leash) behind him and growled, but he did not want to move toward the jeep. I was thinking about explaining to him that he would never eat another treat again when he suddenly got up and started dancing toward the road and the jeep. ———Other than that, I spent an hour or so looking at lots of mls listings in and around our destination city. I might have gotten one good photo today that I can use at my day job. ——— 21°C / 73°F @ 5:30 pm. ——— About half an hour ago we had a short but intense thunderstorm. A few minutes before the storm, Jassper acted like he really wanted to go outside and relieve his bladder or something like that. But when I opened the door (to grey skies and ‘normal’ breezes) he froze in his tracks and headed in the opposite direction. I don’t think I’ve ever heard as loud and long lasting a rumble of thunder as we had maybe ten minutes after Jassper decided he really didn’t want to go outside. The animals looked at me like the wanted to know whether to panic or take it in stride. We had some nasty downpours that sounded like they could shred the aluminum siding and come in like “Shhh shhhh shhhh shhhhhhhh”. But that didn’t last long. The real world outside is wet. But I don’t see smoke clouds rising from anywhere. I don’t have the teevee’s audio turned on or a radio on, so who knows? A sink hole might have opened up and swallowed the next county, but it looks ‘normal’ out there. Now I can get back to making ready for an evening viewing. ———Tuesday, July 30, 2013. 21°C / 72°F @ 3 pm. The viewers opened every door, checked out the bathroom, left wet handprints on the towels. 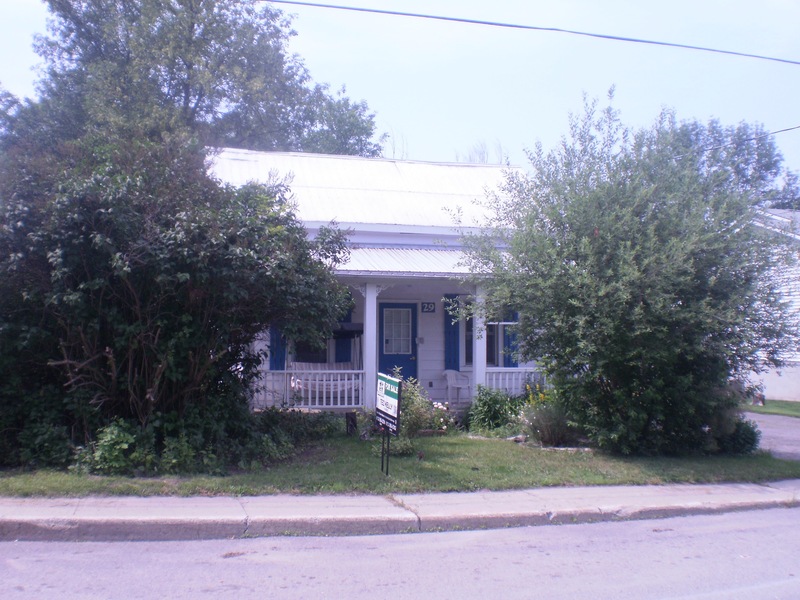 I had a feeling, “The house is sold- They want to offer below the asking price. They want you out of here in five days.” I told Cathi about the five days part and the ‘sold’ part. ———This morning Cathi and I got email. We had an offer. Cathi had to check with her relocation people. The offer was too low. Relocation would not reimburse the difference or anything. Also. Conditions like they wanted to close on August 30th were not possible. Cathi emailed the real estate guy. ‘We’ made a counter offer and we’re playing real estate ping pong. ———I still feel like this is going to work. This offer will rise to an acceptable level. They will be able to move in here in time for whatever they’re worried about. I think the cats and the people of the glen are happy with this. I think Cathi and I will find a place we can get that will make the animals happy, make me happy and make Cathi happy. I went to my mls listings homework browsers and selected five of what I thought were our best choices and most likely candidates for a decent place to live for a reasonable price within reasonable commuting distance and all that. —Mercury has been heading in the right direction for almost ten days now and, according to Astrologists, creative projects and short trips should be going more smoothly than they have been all month, without insane little complications, delays, misdirections and confusions. What do you think? Should we blame all that on the stars? On Fate? ———Anyway- After we’d signed all the dotted lines (which are solid these days) and initialed inside all the rubber stamped circles (which were rubber stamped in red ink) the agent said the buyer would have an inspector come in and if the house passed inspection and the buyer’s bank or mortgage company approved, we’d know in about a week or so and we could then resume breathing and get on with our lives. I felt blind-sided and stunned. This is the first time I’ve been this ‘intimately’ involved in a process like this and it feels very much like it was not designed to be in the best interest of those who make life altering decisions and transitions, it’s designed to have evil, manipulating muther fuppers make as much money from you and steal enough power from you as they possibly can. ——Yawn. I still do not feel relieved. We’re still jumping through hoops. God did not design this universe (or any one of the other universes) to put us through this kind of bull chips. (creative euphemism is fun on my end). ———My head us spinning, my back itches and my stomach isn’t taking any of this in stride. But I did not charge straight through dinner so fast that I gave it all back in explosive fashion. I felt the waves of warning coming and slowed down. I am not a good little lab rat or guinea pig caught in the games and self aggrandizements of nasty little experiments conducted by loveless little ego driven monsters who see the human race as ants to be studied as we find our ways through their godless mazes. ——Yawn, I should be forcing myself to get more rest. ———Thursday, August 1st, 2013. (Cousin Leley’s Birfday, Yay!) 18°C / 64°F & raining @ 11:45 am. —Got off to a slow start this morning. Maybe it’s the weather. When I let the ‘puppy’ out of his crate he charged out enthusiastically and stepped right on my sore toe. I hopped around shouting, “Ouch! OU ou ou ou OU!” & I just realized the English language doesn’t have a good and acceptable abbreviation for that. Ou looks like something that is pronounced “oo” in French, like Ewe or ‘you’ with no leading consonant Y sound. —Gaaa! I’m realizing how much of daily life is aimed at distracting us these days. I’m not happy with that at all. —I just tried to add “Personal Insight” to my list of Categories here and the software tried to tell me I don’t have permission to do that. Imagine being told you don’t have permission to say or think something that isn’t pre-approved by the powers that be? Is big brother that pervasive? Is that where we are heading as a civilization? Are the conspiracy theorists right? —My eyes are burning fiercely and I’m looking at the world expecting to see at least glimpses of a world I’ll be waking up to in a little more than a month. —— Today we got kicked out of house and home while the prospective buyers brought in a home inspector and inspected for almost two hours. ——Jassper continued his beach engineering, trying to extend his trench from McLean Beach to Quebec. ——When we got back the invisible little people upstairs here sent me the message: “Sold, sold, sold.” & they felt happy about it. ——Tonight, we had a slight scare, wondering if Moe escaped and ran away or something. No… he was hanging out inside the cat carrier (travel prison), smiling happily at me and after I ran outside and told Cathi that Moe was safe and smiling in a very strange place. Cathi followed me back inside the house and upstairs to sit on our haunches and smile back at the weird orange cat in the ‘guest cat’s prison/carrier. ——Slightly later, Moe the Orange Cat and Jassper the Puppy Horse (dog) were almost face to face, dog wagging tail, Moe looking like it was never unusual for a dog and a cat to be almost kissing for crying out loud…. ——I think the animals are trying to tell me that they now know what’s going on and they are pretty happy with the place they know we will end up living in. Woah this blog is usually spectacular i really like looking through your content regularly. Sustain the best operate! You’re certain, lots of individuals need circular just for this data, you could possibly help them to tremendously. Very good write-up. I just discovered your blog post and also tried to point out that I’ve absolutely treasured surfing around your own weblog blogposts. In any case I’ll be signing up your rss and i’m intending you write again in the near future! La maison est une combinaison prennent place à salon, chambre, salle prennent place à bains, une cuisine avec un petit jardin élégant. Un décor prennent place à la salle prennent place à séjour peut être fait abordable par l’achat d’accessoires qui sont fabriqués à partir d’acier, câbles en plastique avec enduits. The complete faire davantage prennent place à kit afin de la salon certains meubles avec certains accessoires délicats qui donne à la conception complète afin de la salon. Lorsque vous achetez certains meubles acheter en fonction prennent place à la taille salles prennent place à séjour afin de obtenir suffisamment d’espace libre. Il devrait être abordable afin de vous avec avec la même qualité d’exposition prennent place à temps. Évitez prennent place à construire dans les meubles car elle restreint la mobilité avec la créativité. Décorez avec certains pots, certains peintures avec changer la tapisserie d’ameublement comme les rideaux avec tissus prennent place à canapé, une fois prennent place à temps en temps. Ici, je donne prennent place à précieuses informations sur plombier Winchmore Hill. best health for your pet. There are discounts provided for first time buys while some offerings are given on bulk buy of a drug. the internet, the humongous network of real information and communication that has influenced the lives of huge numbers of people the world over. Välkommen until min ta på David Woods four Steg Content Marketing Strategy. Denna strategi har tagit Mr Wood från noll until hjälte i mindre än ett år. David är nu den ledande rekryterare i hans primära inkomst möjlighet, liksom nummer ett tillverkare i främsta attraktion marknadsföring systemon planeten, MyLeadSystemPro. David credits denna strategi som den huvudsakliga anledningen until att han kunde uppnå en sådan enorm framgång på så kort tid. Jag har nyligen antagit delar av denna strategi i mitt eget företag med mycket positiva resultat. Så inte nog med det att fungera för David, är det nu fungerar för mig. We are not convinced the spot you will be having your details, although good matter. Need to take some time mastering far more or finding out extra. Appreciation for fantastic info I was searching for this info in my assignment. Può essere difficile per ce persone your conoscere quali tipi di percorsi di carriera saranno your loro disposizione senza houston guida corretta ourite informazioni. Appear us consulente di carriera e us consulente gna lavora per una scuola di alta, università e società di consulenza, cuando sarebbe responsabile per aiutare ce persone your identificare potenziali carriere around modo nrrr ottenere houston direzione per illinois loro futuro. Potreste aiutarli your realizzare ce loro potenzialità professionali, identificare ce proprie competenze ourite risorse ourite care to loro alcune idee di lavoro gna un avrebbero mai pensato nrrr soli. Today, a shot began against twelve Russians charged with fighting police during that rally. Exactly who started the fighting in Bolotnaya Square is unclear. Kasparov was a student in the leading of the particular march and was detained, but haven’t yet been faced with a anything. But riot police clashed while using protesters for the eve of Putin’s inauguration. By the end of the time, hundreds of protesters ended up arrested and a few police helmets were bobbing inside nearby river. I happen to be writing to make you be aware of of the terrific encounter my cousin’s princess developed reading your webblog. She realized plenty of details, with the inclusion of what it’s like to have an ideal giving mood to have the others with no trouble know precisely chosen multifaceted subject matter. You undoubtedly surpassed her desires. Thank you for rendering those priceless, dependable, explanatory and as well as cool tips about the topic to Sandra. Au-delà, le patron de l’UMP s’est félicité que son parti soit «bien au clair dans ses convictions et sa ligne politique» et «que nous n’ayons peur d’aucun tabou». N’hésitant pas à donner une dimension nationale au scrutin municipal, il a fustigé la politique du gouvernement socialiste et il n’a pas manqué une nouvelle fois de dénoncer la loi «en faveur du mariage pour tous». Sans craindre de se trouver en porte-à-faux vis à vis de la candidate qu’il est venu soutenir en Alsace, Fabienne Keller… l’une des rares parlementaires UMP à avoir voté pour cette loi. La Malaisie a lancé dimanche une enquête pour acte de terrorisme sur la disparition du Boeing 777, dont deux des passagers avaient embarqué avec des passeports volés, italien et autrichien. with nine out of ten reporting some kind off bullying while iin school. As inn all marketing situations, it ays to have integrity. of a Drupal website to send and track invitations. Effects I usually try to see the great in people. write in relation to here. Again, awesome website! of it and I have you book-marked to see new things in your site. don’t speak about such subjects. To the next! Best wishes!! who truly knows what they’re discussing on the internet. You actually understand how to bring a problem to light and make it important. the usual info a person supply for you visitors?